Start the quest by talking to Ali the Wise in the small north-western most building in Nardah. Consider using Fairy ring code d•l•q and heading south to get into Nardah. Ali starts conversing about Zaros and his conquests over the world, with the help of the Mahjarrat. He remembers talking to one of his colleagues on the matter, Dr. Nabanik who, acquainted to you as well, had asked for your help. He will inform you that Nabanik can be found in the courtyard of the Exam Centre, near the Digsite. 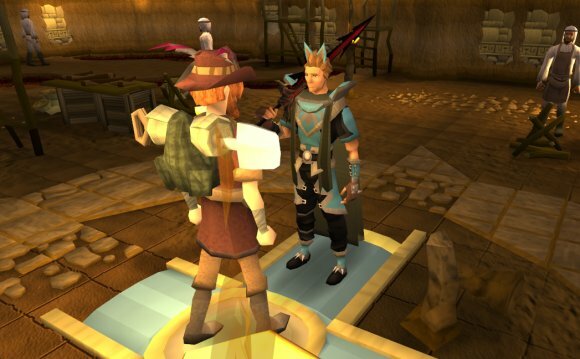 If you ask for help to get to Nabanik, he gives you a digsite pendant (5) in order to conveniently reach the digsite. Dr. Nabanik managing the temple restoration. Outside the exam centre, Dr. Nabanik reveals that he is in fact Azzanadra, the Zaros-loyal Mahjarrat who was freed during the events of the Desert Treasure quest. He will tell the player that he needs consent and authorization from the lead archaeologist to start reconstructing the Zarosian altar beneath the Digsite. Talk to the Archaeological expert inside the exam centre. As a reference for Dr. Nabanik, you will now be quizzed on Dr. Nabanik's credentials; any answers will do. After convincing the lead archaeologist that Nabanik can be trusted, he will give the player a Restoration certificate. Head back to Azzanadra, who takes the certificate off you and tells you to meet him at the altar. To access the site, he provides you with rope. You may use another charge on the pendant for speedy travel. In the Digsite, use the rope on the western-most winch and operate it to enter the Digsite Dungeon. Walk to the ruined altar in the southern part of the dungeon, and meet up with Azzanadra. Players MUST talk to Azzanadra about each mission, or they will not be able to complete either of them. Also, the order of retrieving the artefacts can be chosen by the player. Warning: You will encounter some aggressive high-level icefiends and waterfiends, therefore food and armour are recommended, even for players with a high-level combat. A healing familiar (Unicorn stallion, Bunyip, etc.) to aid you. High quality defence armour, primarily against magic and secondarily against ranged. The Frozen Waste Plateau contains the Ghorrock Fortress, which is not considered a part of the Wilderness, and so once in it, the player is entirely safe from player killers and can teleport out of it. The steel dragons in the area are not aggressive.